FlowForma® Process Automation is the ideal no code solution for HR departments wanting to automate their everyday business processes, reducing administration and improving efficiencies. The HR department is critical to every business and essential to creating a high performance organization. With employees as its customer, the HR departments goal is to improve the employee experience while managing recruitment, performance management, talent management, and so on. A highly process driven department, the HR team can often be burdened by administration work, chasing people for updates regarding performance appraisals, annual leave etc. With many companies striving for digital transformation, HR teams are challenged to drive their own digital strategy. 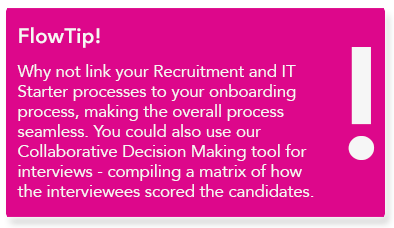 How Can FlowForma Add Value to your HR Team? Often an everyday process for large organizations, we’re surprised how many companies don’t have their employee process automated. Our clients who utilize the FlowForma Process Automation to automate their onboarding process are benefiting from the efficiencies of having a standardized online process, and new hires are empowered with the tools, training and systems they need, when they need them. Performance Appraisal is a time consuming and tedious process across all sectors, often amplified in larger firms. A number of organizations are utilizing FlowForma Process Automation to automate and accelerate this process, providing clear visibility to employees and managers regarding next steps and giving Heads of HR full visibility with regards to status, bottlenecks etc. Some customers have rolled out self-assessment through the tool, where results are instantly received by HR. 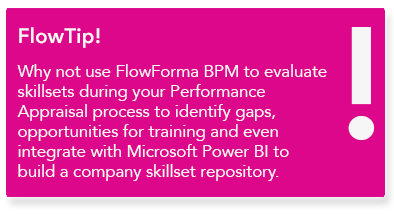 The FlowForma Process Automation tool can be used to streamline your Annual Leave process. By bringing this process online, you can remove the HR burden of unstandardized leave requests, excels sheets and providing employees with leave balance data. With FlowForma Process Automation, the employee experience is improved with mobile app access for leave requests while on the move, clear visibility of leave taken and remaining balance with instant notification of leave approval etc. "We rebuilt a performance appraisal process in around a week, as opposed to the month we would have needed with the old application – that’s a 75% efficiency improvement – and we’ve ended up with something much better than what we had before." The best way to understand how quickly FlowForma Process Automation can transform the way you manage your business processes is to see it in action. Trusted by over 150,000 users worldwide, our process passionate customers are working differently. They’re empowering their business experts to get repetitive work done, collaborate on strategic initiatives and connect external users to processes.